Beautiful sink! I just don't like the metal logo dead center in the front. Other than that, it seems to be very high quality and looks great in our kitchenette. Kraus dual mount granite sinks create an instant style upgrade for the kitchen. Constructed from 80% natural granite, with the look and feel of real stone, these modern kitchen sinks look striking in a variety of settings. Clean lines and thoughtful design details highlight elegance of granite, for an eye-catching look with contemporary appeal. The extra-deep basins accommodate large dishes with ease, while the gently rounded corners make sink maintenance simple. Each non-porous, naturally hygienic sink is protected with a thermal finishing process, creating a surface that is highly resistant to heat, chemicals, scratching, chipping, and discoloration. 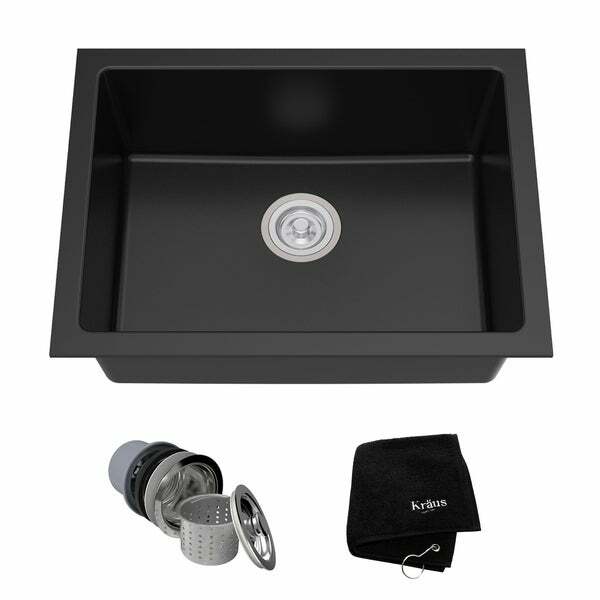 This single bowl sink provides a lifetime of functionality with versatile style. Choose from easy topmount installation, or install the sink as an undermount for a seamless look. For added convenience, a basket strainer drain assembly and complimentary towel are included free with purchase. Constructed from premium stainless steel, the top-quality basket strainer assembly creates a tight seal to prevent food and debris from clogging the drainpipe. For easy installation, all mounting hardware is provided. Experience Kraus Quality and bring your best kitchen ideas to life. Dimensions 24.0 In. X 18.13 In. X 8.25 In. Outstanding finishing touch! product was more than I expected. Top mount installation was a little tricky. Not all side/clips fit,, they made the sink too tight to drop-in. Would not suggest making the counter hole bigger,, template was used to exact specifications. Love the added depth of the sink and the graphite sparkles in the granite complement the graphite faucet. My sink arrived ahead of schedule in perfect condition. Great product, love our new sink. Easy to clean and looks amazing. We installed it with dark walnut wood counter tops and the look is just amazing. I would highly recommend this sink. Wow, great quality sink. The quality of the material is second to none. The sink is a great color and easy to install. Love this sink, perfect size for an island and very stylish. Gorgeous well-made sink with granite that slightly sparkles. Kraus sink is absolutely top notch. This sink has been amazing and so easy to install, my contractor was able to set it up in less than 30 min. After some research, I definitely recommend purchasing it from Overstock over some other retailers because shipping was much faster, and the sink came with no imperfections! We had this installed undercounter when we put in new granite counter tops about 8 months ago. No regrets! It's large enough that I can soak pots and casserole dishes and it's not huge. I don't need a huge sink. Easy to maintain. Love the look.. This sink is gorgeous! Nice dark color. Delivery was quick too! It is spacious, but not too big and deep enough. I can't wait to see it installed in my kitchen! Beautiful, beautiful, beautiful. This would compliment any kitchen for sure. Terrific quality, very deep and easy to care for. I would purchase over and over again. I love everything about this sink. It looks beautiful with my cabinets and granite. Edit- have had for longer now and just wanted to say we still love this sink! We get lots of compliments on it. I am so glad we bought it! I love this sink. It was exactly what I was looking for. It goes great with the grey steel granite counter tops, white cabinets and stainless steel appliances and faucet. I give 5 stars because the fast shipping, and teje price, but I still waiting form mya cabinets yo come so they can instale the sink, I’m super excited. It's a beautiful well made sink. Feels sturdy without being too stone like. It's going to look great in our rental unit without us risking it being damaged horribly. Absolutely beautiful sink. the installation was a breeze and it does not show water spots. The granite composite is very heavy and seems to be indestructible. The delivery was fast and as always free. "What are the interior dimensions of the sink?" "What are the exterior dimensions? I have a base cabinet that I have to be concerned with the overall size. Planning to use it as an undermount." The size that fits my garage base cabinet counter. Correct size and finish, good price. "Basin Length: 21.41 inches Is this an interior or exterior measurement?"